A Canadian paper reports Boeing-Bombardier talk last summer included the idea of an ownership stake in the CSeries for the U.S. company. Also: The Army Corps of Engineers weighs in on Zillow sea-level-rise analysis, and betting on Amazon HQ2 sites. Talks between Boeing and Bombardier last summer included the possibility that the U.S. plane maker would take an ownership stake in the Canadian company’s CSeries jet program, the Globe and Mail reported this week. The negotiations brokered by Canadian government officials were ended by Boeing a few weeks before the U.S. International Trade Commission, acting on a complaint brought by Boeing, imposed massive tariffs on any purchases of the plane by U.S. airlines. Bombardier subsequently stunned the industry by selling majority control of the CSeries program to Boeing’s archrival, Airbus. The Canadian newspaper reports that in talks beginning in June, two options were on the table. According to the Globe & Mail, officials at the Embassy of Canada in Washington, D.C., as well as from Canada’s foreign and international trade ministries were involved. Boeing Chairman and Chief Executive Dennis Muilenburg also took part. U.S. Commerce Secretary Wilbur Ross knew of the talks and didn’t object, but the U.S. government wasn’t part of the discussions. “Boeing told the Canadians they were interested in a deal and Canada’s proposals were constructive,” according to the newspaper. The report offered no new details on why those talks broke down, and Boeing and Bombardier did not comment on the Globe and Mail’s account. 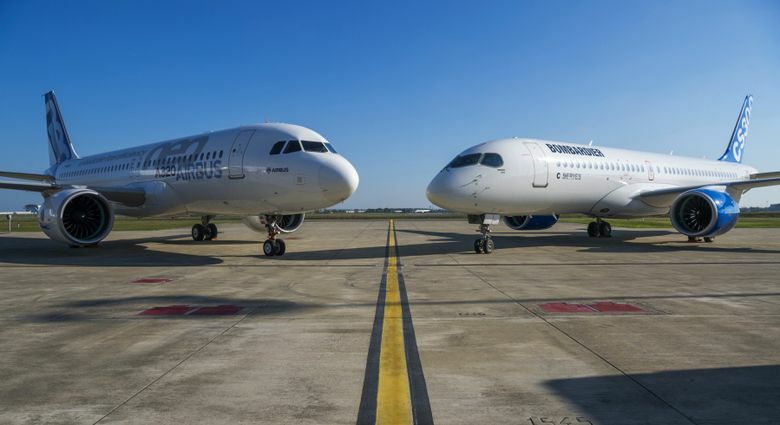 Bombardier then quickly resumed its previous negotiations with Airbus, crafting a deal that analysts have said likely circumvents the onerous U.S. tariffs: Airbus will do final assembly of CSeries jets for the U.S. market in Alabama. Boeing’s trade case objects to government support for the CSeries by Canada and the U.K., where the jet’s wings are built. The controversy has frayed Boeing’s relations with both nations, and with U.S. airlines interested in the CSeries. Through June, Bombardier has won 360 firm orders for the CSeries, according to Bloomberg News. Delta Air Lines is the biggest buyer, with a firm order for 75 aircraft and options for 50 more. Last week Sunday Buzz reported on a Zillow analysis that said more than 5,000 Seattle-area homes could flood by the end of the century if local sea levels rise at least six feet. That included homes along Lake Union and Lake Washington, and the story noted that Zillow’s analysis didn’t take into account whether the Ballard Locks could prevent lakefront homes from flooding. The U.S. Army Corps of Engineers, which operates the Locks, says Puget Sound waters would need to rise at least 6.6 feet for properties on Lake Union and Lake Washington to potentially flood. That’s 7 to 8 inches higher than the 6-foot water-level rise included in Zillow’s analysis, which used government forecasts on potential sea level rise through 2100. Zillow initially said 5,042 Seattle-area homes could be in danger of flooding if sea levels rise 6 feet — about 1 in every 200 homes across the region. But about 1,010 of those homes are along the lakefront and would not be in danger of flooding unless sea levels rise at least 6.6 feet, the Corps says. That leaves about 1 in 250 local homes at risk. As Amazon begins to sort through the 238 proposals it received to host its second headquarters, an Irish bookmaker is setting the odds. Paddy Power had Atlanta as the favorite as of Friday afternoon, at 3-1 odds. The city is followed by Austin, Texas, and Boston, at 7-1; and Toronto at 12-1. The four cities do well in several analyses of Amazon’s criteria for its so-called HQ2, which include an educated workforce and access to a major airport. Austin, a favorite of some analysts for its rising tech scene, low taxes, and vibrant cultural institutions, has been a big mover since the novelty bet went live earlier this week, briefly rising to co-favorite with Atlanta before slipping back. Portland checks in at 14-1. The Seattle area’s many longshot applicants don’t even make the roster of 24 picks. Paddy Power also offers citizens of Ireland and Australia the opportunity to part with their money in a wager that Amazon will reverse course, abandon its plans to build HQ2 somewhere in North America, and go abroad: Dublin and Melbourne sit at 100-1, tied with Halifax, Canada. By the way: Online gambling is illegal in most U.S. states, including Washington.